Review: Georgetown University is a private Jesuit research university whose main campus is located in the Georgetown neighborhood of Washington, D.C. 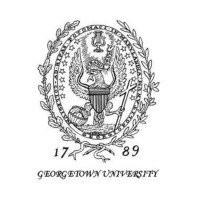 The oldest Catholic university in the United States, Georgetown administers 180 programs in four undergraduate schools, three graduate and professional schools, and several specialized institutes. The faculty in international affairs and law are particularly well regarded, as most programs are highly selective. Georgetown's three urban campuses are laid out using quadrangles and rectangular lawns, with various facilities for research, sports, housing, and services. The main campus is known for the neo-Romanesque Healy Hall, a National Historic Landmark. John Carroll, later the first American bishop, founded the school in 1789, realizing efforts dating from 1634 to establish a Roman Catholic college in the province of Maryland. Georgetown expanded into a branched university after the American Civil War under the leadership of Patrick Francis Healy. Born a slave by law, Healy rose to become university president and is considered the school's second founder. Though governed independently of church authorities or the order, Jesuits have been officially involved in the school since 1805, and the institution defines its identity in significant part through its religious heritage. The university is co-educational and has around 7,000 undergraduate and over 8,000 post-graduate students from a wide variety of religious, ethnic, and geographic backgrounds, including all 50 U.S. states and over 120 countries. Campus groups include the nation's oldest student theater group and the largest student-run business. Georgetown's most notable alumni have served in leadership positions in government in the United States and abroad; among them are former U.S. President Bill Clinton, U.S. Supreme Court Justice Antonin Scalia, and the current heads of state or government of six countries. The Georgetown athletic teams are called the Hoyas. The men's basketball team has won a record seven Big East championships, has played in five Final Fours, and won the national championship in 1984. Location & access map for "Georgetown University (DC)"